I have been on a reading kick. Yeah, I know...sometimes I just want to veg in front of the TV thinking of nothing but sometimes I just love to read--vociferously! Carryout Satellite Dish which only gets SD stations--not a problem for most programming we watch actually. The problem comes in with the fact that our Carryout has only two feeds into the camper, so we are limited on how many shows we can tape. We have our own receiver box and so are limited to setting up 50 shows to tape. I know that sounds like a lot, but we really like to keep ALL of the shows we want to tape for the whole year in our list so as not to miss any episodes (and NASCAR takes up about 6 or 7 of those spaces for taping since it it shown on several different channels throughout the season!) so we now keep a list of our shows and make sure that as soon as the final episode of a show tapes, we delete that one from the recording list so we can replace it with an upcoming show. In the meantime, our internet access is also limited here. The campground has Tengonet wireless internet for the entire campground and it has a great signal. The problem with Tengonet is that it is really designed to download and check e-mail and perhaps a few rudimentary other things. It is not made for streaming or surfing at all! So, we are using our wireless hotspot, but that has it's limitations in that it does eat up your data quickly when doing some things on the net unless you want to spend a LOT of $$$$$ for a LOT of mb of data, so my computer life has been a bit curtailed. Enter my books on Kindle. So, with limited internet and limited shows (we only record the ones that we both watch and then watch those together generally) I have been reading...a LOT. I went through the David Baldacci King and Maxwell Series of books because the series King and Maxwell was on TV for a season and I really liked the show. I went on to his Will Robie Series and then Flew through the Camel Club series and on to the John Puller series. I truly enjoyed these books. I think if you like Tom Clancy books, you will like David Baldacci. to get to the Hannah Swensen Mystery Book series which I had downloaded a couple years ago but haven't read yet. Where Goldy Bear Schulz was a caterer and cooked many types of foods--and giving me some really good recipes in the process--Hannah Swensen has a shop called the Cookie Jar that sells--uh--cookies. 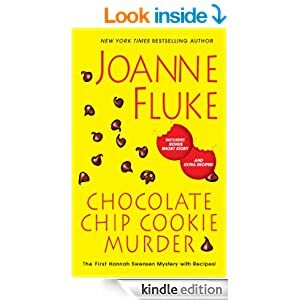 So far, I have found some recipes for cookies that sound really good and a few candy recipes to boot and I am only on book #2! In Book #1, Hannah comes to work as usual and then notices that her milk delivery is very late. The milk man is always on time so she heads out to the alley and sees that his truck is there. Upon investigation, she finds he has been shot and is dead and thus begins a murder mystery that she strives to unravel with the help of her brother-in-law Bill, a local police officer who is in line to make detective if he can solve this case. All the while Hannah's mother is trying to hook her up with every and any available man and ends up with not only one but TWO beaus. 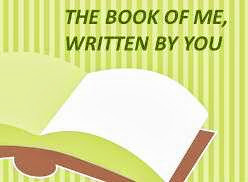 It is a light and fun book with a nice twist at the end and some very interesting recipes! Very good book for a first out of the gate for sure! Now, on to the second...I just started this one today. When the president of Hartland Flour chooses cozy Lake Eden, Minnesota, as the spot for their first annual Dessert Bake-Off, Hannah is thrilled to serve as the head judge. 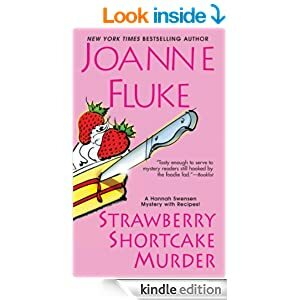 But when a fellow judge, Coach Boyd Watson, is found stone-cold dead, facedown in Hannah's celebrated strawberry shortcake, Lake Eden's sweet ride to fame turns very sour indeed. Between perfecting her Cheddar Cheese Apple Pie and Chocolate Crunchies, Hannah's snooping into the coach's private life and not coming up short on suspects. And could Watson's harsh criticism during the judging have given one of the contestants a license to kill? The stakes are rising faster than dough, and Hannah will have to be very careful, because somebody is cooking up a recipe for murder. . .with Hannah landing on the "necessary ingredients" list.